Many believe that eating healthy unprocessed foods takes a lot of time out of their day and that it doesn’t taste good. I find that FOOD TASTES BETTER when you make it fresh and use unprocessed ingredients. This is the experience I try to share with my students when they come to my cooking classes. 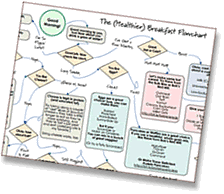 As a Chef, I judge successful meals by what gets eaten and what ends up in the trash along with the oohs and ahs people make as they are eating…and nothing we cook ends up in the trash at our cooking classes! In fact, students scramble to take the leftovers home. It is a true joy for me to watch their discovery of how easy and delicious making fresh food at home can be. 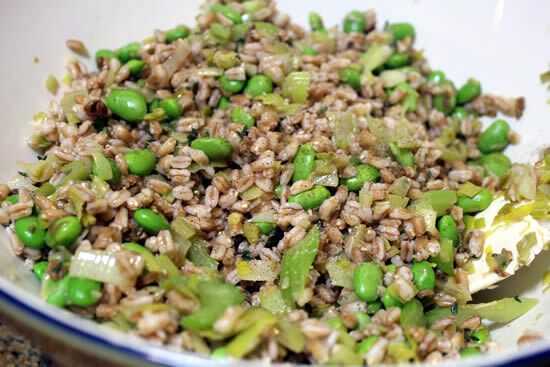 Getting dinner on the table in 30 minutes or less was the topic of one of my many cooking classes and this recipe for an Italian Farro Salad with Favas or Soybeans was the perfect combination of an authentic Italian dish with lots of flavor that is both fresh and healthy. It contains traditional Italian ingredients from the earth – farro, favas, porcini mushrooms, leeks and fennel along with freshly shaved Pecorino or Parmigiano cheese. Watch for farro to become the next “hot” heirloom grain that you will begin to see on your supermarket shelves – at least I hope so because I really like it and it is currently difficult to find. I obtained my farro from two sources – Melissa’s, who just launched this new product and Marx Foods, who kindly sent some to me in a goodie box. I also found an Italian brand at Bristol Farms Market. Farro is an Italian whole wheat berry – completely unprocessed. It stays al dente once cooked and has a great nutty flavor. Try it, you’ll like it! If you’ve never eaten fava beans they are different than other beans as they have an inner and outer shell. I prefer to shell my favas and cook them ever so gently for a fresh taste. When you cook them there will be a translucent shell around the bean that is edible. If you have larger more mature beans, then you may want to peel the bean of the inner shell as it may be tough. If fava beans are not available, use soybeans (fresh or frozen) in this salad or use a combination of both. In Southern California, fava beans are grown in the winter and are generally available at our Farmer’s markets March-June. The leek and fennel bulb are traditional Italian vegetables and are known as dirt or soil carriers. They need to be cleaned carefully before using. Slice both the leek and fennel bulb vertically down the center so you end up with two long pieces. This will expose the soil hiding in the layers of each vegetable. You can then wash it away. At this point you can then make thin slices in each piece horizontally. Rinse the sliced pieces in a collander before adding to your skillet. This dish can be prepared in 30 minutes when you multi-task. Get a pot of water on the stove while you run some hot water in a small bowl for the mushrooms. Once you have these two tasks underway, then you can work with your vegetables to complete the dish. Once everything is cooked, it is a quick assemble process and on to eating! Porcini mushrooms are only available dried in this country. They are pricey, but a little goes a long way, because the flavor is very intense. Save the soaking liquid in the freezer and use in place of stock in a sauce or soup. 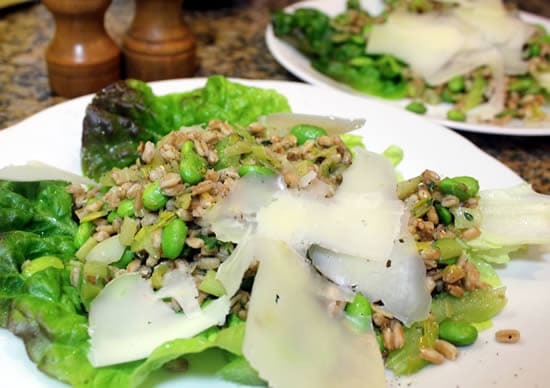 This recipe contains traditional Italian ingredients from the earth – farro, favas, porcini mushrooms, leeks and fennel along with freshly shaved Pecorino or Parmigiano cheese. Soak dried mushrooms in about 2-3 cups hot water from the tap. Leave sit on the counter for 15 minutes or more…until mushrooms are rehydrated. Drain when ready to use in salad. Save liquid (minus sand at bottom) for another recipe like a soup. Chop mushrooms fine – mince like garlic – and set aside. Rinse the farro in a colander under running water until clear. Cook the farro in boiling salted water for about 20-30 minutes until farro is al dente. Farro will be soft, but crunchy. Once the farro is cooked, drain the farro and place in your salad bowl. While mushrooms are soaking and farro is cooking, prep vegetables. Coat skillet with olive oil and turn to medium heat. Add leek, fennel, celery, and cook until soft. Add drained mushrooms when they are ready, along with minced garlic and fava or soy beans and cook until heated through and beans are tender crisp. When done, add to the salad bowl. Assemble salad in bowl by combining farro, vegetable mixture, thyme leaves. Toss mixture and then add in salad greens or serve on a bed of lettuce. Season with salt and pepper and drizzle with additional olive oil. Divide among plates and shave cheese over the top. Serve. This sounds yummy! Thank you, Patricia!